The shuttle Discovery's six-member crew worked through a dress-rehearsal countdown aboard the shuttle Discovery Friday, setting the stage for launch Nov. 1 on a space station assembly mission. It will be Discovery's 39th and final flight. And see the day's photo gallery. The Astrovan is departing launch pad 39A to drive Discovery's astronauts back to Kennedy Space Center's crew quarters building. This will conclude our live play-by-play reports of today's successful countdown dress rehearsal for the space shuttle. The crew is scheduled to return to the pad this afternoon for a sharp-edge inspection of the payload bay before the doors are closed tomorrow. Then they'll fly back to Houston to complete their final two weeks of training there. The crew is getting into the elevator to leave the 195-foot-level of the pad tower. The Astrovan is pulling up to the launch pad to retrieve the crew after they finish things on the tower. All six astronauts have exited Discovery and headed for the slidewires on the west side of the pad's Fixed Service Structure tower to practice hopping into the baskets while wearing their launch suits and helmets. The crew uses the buddy system in scurrying to the baskets in pairs. The crew is beginning to egress the shuttle now, all still wearing their helmets. "I think it went real well, right by the book," commander Steve Lindsey says. "I wish we could save this weather for November 1st." Once the astronauts complete their post-countdown work, they will climb out the hatch and practice hurrying to the slidewide baskets on the opposite side of the launch tower. These baskets would be used to evacuate the crew to the ground where a fortified bunker awaits. They won't actually ride the baskets today, however. The launch team completes initial safing of Discovery and the launch pad following the main engine shutdown rehearsal. The team members are going through the procedures they would use if such a situation happened on launch day. In reality, there have been five such aborts in shuttle history, the most recent in 1994. Today's countdown demonstration has concluded with the simulated ignition and shutdown of Discovery's three main engines. This is known as a Redundant Set Launch Sequencer abort, indicating the shuttle's onboard computers detected a problem during engine start that forced an emergency stop of the countdown before solid rocket booster ignition. CUTOFF! Countdown has been halted at T-minus 4 seconds as planned in today's simulation. Safing is underway to rehearse a pad abort scenario. T-minus 10 seconds. "Go" for main engine start. T-minus 31 seconds. Auto sequence start! The handoff has occurred from the Ground Launch Sequencer to the space shuttle. Discovery's computers now controlling the final half-minute of the countdown. T-minus 1 minute. Computers would verify that the main engines are ready for ignition, the sound suppression water system would be armed to activate at T-minus 16 seconds to dampen the sound produced at launch and the residual hydrogen burn ignitors would be armed to fire at T-minus 10 seconds to burn off hydrogen gas from beneath the main engine nozzles. The countdown has resumed after half-minute hold. T-minus 1 minute, 57 seconds and holding. The launch team has stopped the clock at one of the several milestones available for holding the countdown. Once the count passes this point on launch day, the liquid hydrogen tank is pressurized. T-minus 2 minutes, 15 seconds. The astronauts are being instructed to close and lock the visors on their launch and entry helmets. T-minus 2 minutes, 45 seconds. The external tank liquid oxygen tank pressurization simulation has started. T-minus 3 minutes, 30 seconds. Normally at this point in a real countdown, the aerosurfaces and main engine nozzles of Discovery would be moved through computer-controlled test patterns to demonstrate their readiness to steer the vehicle during launch. However, none of these activities happen today. T-minus 4 minutes. Activation of the APUs is complete with three units simulated to be up and running. Also, the orbiter's heaters have been configured for launch by commander Steve Lindsey. The final helium purge sequence is underway in the main propulsion system. This procedure readies fuel system valves for engine start. T-minus 5 minutes and counting again after a 50-second hold. The "go" has been given for the simulated Auxiliary Power Unit start. Pilot Eric Boe would flip three switches in Discovery's cockpit to start each of the three APU's. The units, located in the aft compartment of Discovery, provide the pressure needed to power the hydraulic systems of the shuttle. The units will be used during the launch and landing phases of the mission for such events are moving the orbiter's aerosurfaces, gimbaling the main engine nozzles and deploying the landing gear. T-minus 5 minutes and holding. The clock has stopped briefly as part of the demonstration test. T-minus 6 minutes. Pilot Eric Boe has been asked by Orbiter Test Conductor to simulate pre-starting the orbiter Auxiliary Power Units. This procedure readies the three APU's for their activation after the countdown passes T-minus 5 minutes. T-minus 7 minutes, 30 seconds. The Ground Launch Sequencer is simulating retraction of the Orbiter Access Arm from the crew hatch on the the vehicle. The arm was the passage way for the astronauts to board Discovery earlier this morning. T-minus 9 minutes and counting. The Ground Launch Sequencer is now controlling the final phase of today's countdown to the pretend launch of space shuttle Discovery at 11:04:20 a.m. EDT. Clocks remain holding at T-minus 9 minutes, pushing back the mock liftoff time beyond 11:00 a.m. The launch team is being polled now and the countdown will resume shortly. Now half-way through this planned hold. Final readiness polls are coming up. It is a beautiful morning at the Florida spaceport and all weather rules are "go" for launch. T-minus 9 minutes and holding. The next pause point in the countdown has been reached. This hold is scheduled to last 10 minutes. Shuttle Discovery will be taking its 39th and final spaceflight after 26 years of service to America. The vehicle's rich history (to date) includes 351 days in space, precisely 8,441 hours, 50 minutes and 41 seconds spent in flight. Its missions have spanned 5,628 orbits of Earth and accumulated 142,917,535 miles. Discovery carried out both space shuttle program return-to-flight missions in 1988 and 2005, performed daring satellite repair missions in the early 1980's, deployed the Hubble Space Telescope and the Ulysses solar probe during launches in 1990, did the first rendezvous with the Russian space station Mir in 1995 and final joint shuttle docking in 1998, and has conducted a dozen trips to the International Space Station thus far. Once retired from service after the STS-133 mission, Discovery will be safed and readied for display at the Smithsonian. T-minus 20 minutes and counting. Clocks are running again and headed down to the T-minus 9 minute mark where the next hold is scheduled. T-minus 20 minutes and holding. Countdown clocks have gone into the planned 10-minute hold. Today's simulated launch remains set for 11:00 a.m. EDT. Communications checks have been completed with the ascent flight control team in Houston and CAPCOM Charlie Hobaugh. Commander Steve Lindsey is simulating pressurization of the gaseous nitrogen system for Discovery's Orbital Maneuvering System engines while pilot Eric Boe goes through the steps to activate the gaseous nitrogen supply for the orbiter's Auxiliary Power Units' water spray boilers. T-minus 1 hour and counting. The orbiter closeout crew has finished the hatch closure test and reopened it. With all of the astronauts inside the spacecraft, the launch pad crew is shutting the crew module hatch to run through those procedures for practice. The final Discovery astronaut has boarded the shuttle today. Tim Kopra just entered the hatch to sit on the flight deck's aft-center seat as mission specialist No. 2 and flight engineer. The Austin native is an Army colonel and previously flew as an Expedition 20 astronaut aboard the International Space Station last year. He launched on Endeavour's STS-127 mission and returned to Earth some 44 days later on Discovery's STS-128 flight. Heading back to orbit for the second time now, Kopra will lead the mission's two spacewalks to perform maintenance and upkeep tasks around the space station. Astronaut Al Drew was an Air Force helicopter pilot and flew combat missions in Panama, the Persian Gulf and Northern Iraq during his military career before coming to NASA in 2000. He is ingressing the flight deck's aft-right seat as Discovery's mission specialist No. 1. This flight calls for the Washington, D.C., native to perform a pair of spacewalks outside the space station with fellow astronaut Tim Kopra. Now passing the T-minus 2 hour mark in the countdown. A pair of 10-minute built-in holds are planned at T-minus 20 minutes and T-minus 9 minutes, leading toward the 11:00 a.m. T-0 time. Nicole Stott, another previous resident of the International Space Station, serves as Discovery's mission specialist No. 4 for her second spaceflight. She just entered the orbiter's hatch to take the right-hand seat on the middeck. The astronauts have arrived at launch pad 39A to start climbing aboard the space shuttle Discovery. After getting off the Astrovan, the crew took an elevator up to the 195-foot-level of the tower to reach the orbiter access arm that swings over to Discovery's hatch. HERE COMES THE CREW. Space shuttle Discovery's six veteran astronauts have departed Kennedy Space Center's crew quarters building for this morning's countdown dress rehearsal. Commander Steve Lindsey, pilot Eric Boe and mission specialists Al Drew, Tim Kopra, Mike Barratt and Nicole Stott are heading to launch pad 39A where they will climb aboard the orbiter today. T-minus 3 hours and counting. Clocks have resumed ticking for the Terminal Countdown Demonstration Testing, still targeting an 11:00 a.m. EDT pretend liftoff time for Discovery this morning. T-minus 3 hours and holding. The countdown is nearing the end of this scheduled built-in hold. On the real shuttle launch day, fueling of Discovery will be long finished by this point in the count. But following through with the sequence for this morning's dress rehearsal, the orbiter closeout crew is working pad 39A to ready Discovery for the astronauts' arrival. Kay Hire, a two-time shuttle flier and a member of the closeout team today, has been busy in the cockpit configuring switches and verifying systems with the launch control center. The team will assist the astronauts getting strapped into their seats just like launch day. Good morning from just outside the Operations & Checkout Building where the astronauts are upstairs on the third floor getting ready for this morning's practice launch countdown. The O&C Building serves as the crew quarters here at Kennedy Space Center. It is a site with a historic past in preparing the Apollo spacecraft for lunar voyages, then later housed the Spacelab modules during the shuttle era and will support the Orion capsules of the future. Discovery's crew is scheduled to emerge around 7:45 a.m. EDT and board the Astrovan for the ride to launch pad 39A. Countdown clocks around Complex 39 are ticking for Friday's dress rehearsal by the space shuttle Discovery astronauts to culminate the week's exercises at Kennedy Space Center. "The vehicle is looking great, all of our activities are going great," commander Steve Lindsey told reporters at pad 39A this morning. "We are basically trained and ready to fly, just a few more weeks of activities we need to go through and then we'll hopefully be back here for an on-time launch November 1." The Terminal Countdown Demonstration Test underway at the Florida spaceport has put the crew through emergency procedure drills and given Lindsey and pilot Eric Boe some time to practice landing approaches in the Shuttle Training Aircraft. TCDT is building toward the simulated launch morning that occurs Friday for a mock 11 a.m. liftoff time. We will provide live updates throughout the morning right here on this page as the crew heads for the launch pad and gets strapped aboard Discovery for the final three hours of the countdown. Meanwhile, technicians working inside Discovery's payload bay have connected the remote-control power umbilical that feeds the Permanent Multipurpose Module electricity from the orbiter. The payload interface verification testing has been completed successfully this week as well. The astronauts have arrived for their Terminal Countdown Demonstration Test at the Florida spaceport. Live video of the crew's comments is coming up. The T-38 aircraft with commander Steve Lindsey, pilot Eric Boe and mission specialists Tim Kopra and Al Drew are taxiing off the runway now. Good afternoon from the Shuttle Landing Facility where reporters and photographers have gathered to cover the astronauts' arrival. The T-38 jets carrying Stott and Barrett actually touched down about 40 minutes ago. We're awaiting the other two aircraft with Lindsey, Kopra, Boe and Drew. Discovery's crew has departed Ellington Field outside Houston's Johnson Space Center for this afternoon's trip over to Florida's Kennedy Space Center. Arrival out at the Shuttle Landing Facility runway is anticipated around 5 p.m. EDT. Space shuttle Discovery's astronauts will be welcomed to the Kennedy Space Center this afternoon to begin the Terminal Countdown Demonstration Test activities. TCDT week includes emergency training drills and a launch day dress rehearsal for the crew. Arrival at the spaceport runway is expected around 5 p.m. EDT. We'll provide live streaming video of the event, which will feature some comments by commander Steve Lindsey. 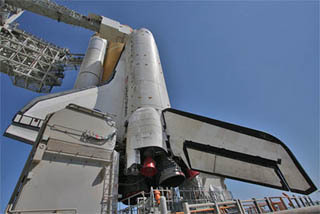 The launch pad's mobile gantry, with the mission payloads safely tucked inside its cleanroom, was rotated to enclose space shuttle Discovery this morning. The orbiter's payload bay doors will be opened for Monday's planned installation of the space station module and supply carrier. The gantry will remain around Discovery until 8 p.m. the night before launch when it retracts to reveal the shuttle for the final countdown. The PMM and ELC 4 payloads were offloaded from the transport canister to the ground handling mechanism inside the pad gantry today, after a controller hardware glitch was fixed that delayed the operation yesterday. The canister is scheduled to be lowered out of the launch pad at midnight and the rotating service structure moved at 6:15 a.m. EDT Saturday to enclose Discovery. Plans for installation of the mission cargo into the shuttle's payload bay remains scheduled for Monday. A special transport canister shaped like the shuttle's 60-foot-long payload bay and possessing the Permanent Multipurpose Module and the Express Logistics Carrier No. 4 was hoisted into launch pad 39A this morning. But work to unload the payloads onto the handling mechanism inside the pad's cleanroom has been delayed by a controller problem. Engineers hope to get the issue resolved on Friday and the canister lowered away by early Saturday, allowing the service tower to roll back around Discovery. Otherwise, preparations have been going very smoothly for the November 1 launch. The program-level flight readiness review occurred Wednesday and gave unanimous approval to press ahead toward the agency-level review on October 25. PMM and ELC 4 are destined to become part of the International Space Station during Discovery's construction flight to the outpost. The transporter has climbed up the ramp to the pad surface. Technicians plan to start the canister lifting operations on the gantry after 4 a.m. The payload convoy is passing the Vehicle Assembly Building en route to the pad. Just three-and-a-half miles to go. The payload's drive to launch pad 39A is underway right now. The canister should reach the complex in a couple of hours, then get lifted into the gantry by dawn. The rotating service structure at pad 39A was retracted away from space shuttle Discovery this morning in preparation for arrival of the payloads early Thursday. The gantry features a payload changeout room and the equipment to insert the mission hardware into Discovery's cargo bay. After the payload canister reaches the pad, it will be hoisted into the tower and the contents unloaded into the cleanroom. The canister then lowers away and the gantry placed back around the orbiter to transfer the payloads to Discovery. The payload transporter left the Space Station Processing Facility on Tuesday and was taken to the special building where today it was turned vertically to stand upright. The journey to pad 39A begins at 12:01 a.m. Thursday. Meanwhile, the space shuttle program's flight readiness review began this morning to assess technical status and the progress of pre-launch work. The meeting's findings will be rolled into the agency-level review later this month that establishes the official launch date. For now, Discovery remains scheduled for blastoff on November 1. The Permanent Multipurpose Module was plucked from the scaffold-like workstand and stowed within the payload transporter early this morning for the journey to launch pad 39A. The mission's other payload -- the Express Logistics Carrier No. 4 -- was installed in the transporter last week. The trip out to the pad has been rescheduled to start at 12:01 a.m. EDT Thursday and take about four hours, as a motorized trailer hauls the canister from Kennedy Space Center's Industrial Area to Launch Complex 39. Both payloads will be attached to the International Space Station during shuttle Discovery's mission next month. The PMM becomes a bonus room for storing equipment and the ELC 4 will serve as another external spare parts depot. Work to fuel Discovery's maneuvering engines has been completed, officials reported this morning, and the space shuttle team at pad 39A will take the rest of this weekend off. The hazardous fuel loading continues on space shuttle Discovery today as technicians load the orbiter's reaction control system thruster tanks and orbital maneuvering system engine pods with fuel and oxidizer. The orbiter's auxiliary power units are being serviced as well. Meanwhile, the Permanent Multipurpose Module that Discovery will haul to orbit remains within its workstand at the Space Station Processing Facility. Earlier plans for hoisting the module into a transporter has slipped a few days. But NASA still expects delivery to the launch pad to happen next Wednesday. Work is underway to service the hydraulic power units on space shuttle Discovery's solid rocket boosters. The HPUs enable the motor's nozzles to swivel during ascent and steer the shuttle. This is the first phase of a multi-day task to load the storable hypergolics into the shuttle vehicle. Five lightning strikes were detected within a half-mile of launch pad 39A on Tuesday afternoon as stormy weather passed through the Central Florida region. But engineering evaluations and reviews have determined that no damage was done to either Discovery or ground support equipment. Preparations are underway at launch pad 39A to begin loading storable hypergolics into Discovery and the twin solid rockets for the hydraulic power units and maneuvering thrusters. Meteorologists have been tracking the development of Tropical Depression No. 16, which is currently southwest of Cuba and moving northeasterly. Although the system will pass over Florida, it won't be intense enough to prompt safing procedures around Kennedy Space Center or force Discovery's rollback to the Vehicle Assembly Building. The Express Logistics Carrier No. 4 for the International Space Station was loaded into the transportation canister at Kennedy Space Center this morning, bound for shipment to launch pad 39A. The flight readiness test of space shuttle Discovery's three main engines, pre-launch positioning of the nozzles and a leak check of the main propulsion system using helium were the among the activities performed this week following arrival at the launch pad. The gaseous hydrogen vent arm and its ground umbilical carrier plate have been mated to the backside of the external tank as well. The rotating service gantry that was placed around Discovery on Tuesday evening will be reopened for Saturday's Family Day at the Kennedy Space Center, displaying the shuttle in all its glory for workers and their loved ones to see up close.